From CA And IN Warehouse. 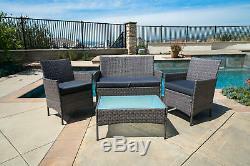 Rattan Outdoor Patio Set 4 PC Furniture: 2 Chairs + 1 Glass Table + 1 Sofa Brown. The&###xA0;rattan 4 piece bistro set feature a outdoor weatherproof sofa, chairs and table set offers you a quiet, cozy space outdoors to host a conversations, read a book, enjoy morning coffee or whatever else you should find to do outdoors. Complete with seat cushions, it includes one sofa, two chair and a coffee table with tempered glass. The pattern on the chairs adds eye catching detail. Perfect for year round enjoyment. Elegant and Comfortable &###xA0; 4-Piece Wicker set will transform your outdoor area into a cozy private retreat. Perfect for garden, backyard, porch, poolside, patio or conservatory. Resin Wicker hand stretched over a powder coated frame for light weight yet durable construction. Beautiful diamond pattern woven into the design adds a touch of class. Simple and minimal assembly is required. Design of this patio set suits a range of tastes and preferences, which complements any Outdoor/Indoor living space. Table with removable tempered glass adds a sophisticated touch and allows you to place drinks, meals, or decorative items on top. Seat Cushions&###xA0;Water-repellent & Stain-resistant fabric - zipper construction for easy cleaning. Removable Cushions&###xA0;covers for easy cleaning, simple to clean. Available Color: &###xA0;Gray, Black & Brown. Material: Wicker/Rattan & Steel Frame. Table Top Material: Tempered Glass. Table Glass Size: 29"(W) x 18-1/2"(L). Table Overall Dimension: 31-1/2" x 19"(L) x 15(H). Seat Height w/ Cushion: 19-1/2. Chair Seat Back: 18-1/2(W) x 15:(H). Chair Seat Bottom: 19"(W) x 18"(L). Each Chair Overall Dimension: 24"(W) x 21-1/2"(L) x 33(H). Sofa&###xA0;Seat Back: 37-1/2"(W) x 15-1/2"(H). Sofa&###xA0;Seat Bottom: 38"(W) x 18"(L). Sofa&###xA0;Overall Dimension: 42-1/2"(W) x 21-1/2"(L) x 33(H). Maximum Set Seating Capacity: &###xA0;4. Note Our digital images are as accurate as possible. However, different monitors may cause colors to vary slightly. TheEveryMart is one of America top online suppliers of specialized Home Furniture, Home Appliances, Garden products, and High Quality Aftermarket Car Parts. For over 10 years, TheEveryMart has been providing customers years of insurmountable service. Our highly trained, professional staff provides in-depth knowledge and exceptional personal assistance to customers worldwide. Our number one commitment is to provide unbeatable service at unbeatable prices. Founded in the heart of Los Angeles California, our 400,000 sq/ft warehouse houses thousands of the most comprehensive collection of household tools, home & garden and aftermarket automotive items to fit any of your needs. TheEveryMart works closely with product manufactures, eliminating middlemen so we can pass the savings onto you. Used items will not be accepted for return. Under no condition will TheEveryMart be liable for any damages, and in particular will not be liable for special, indirect, consequential, or incidental damages, or damages for lost properties, revenue or use, arising out of or related to the TheEveryMart account or the information contained within it, whether such damages arose in contract, negligence, tort, under statute, in equity, at law or otherwise. Who do I contact if I receive a damaged product? If your product is damaged, you may use the contact form provided. Do you offer wholesale prices? We do not offer wholesale pricing. Do you offer any installation services? We do not offer installation services. The item "4pc Patio Furniture Set PE Wicker Cushioned Outdoor Rattan Sofa Deck Lawn Garden" is in sale since Sunday, March 18, 2018. This item is in the category "Home & Garden\Yard, Garden & Outdoor Living\Patio & Garden Furniture\Patio & Garden Furniture Sets". The seller is "theeverymart" and is located in Rowland Heights, California.